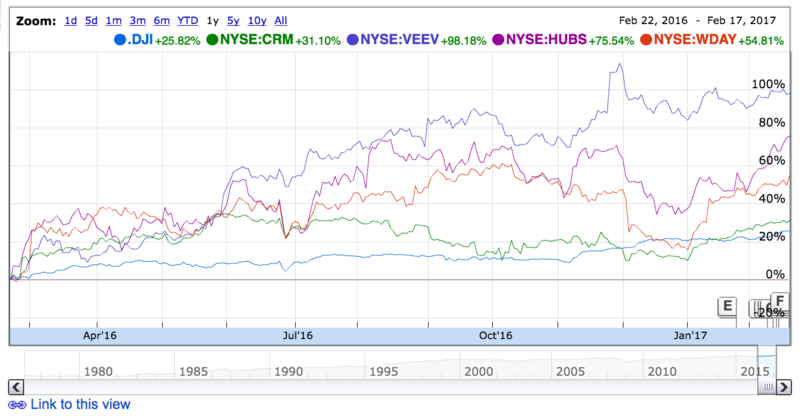 For reference, I’ve added Netsuite (which, before acquisition price action looked a lot alike the other graphs), so it looks consistent. Not sure which conclusion to make here. It looks like SaaS seems to be a high-beta play for investors (more volatile than general markets, but basically following the same direction (so if the market goes up by 1%, SaaS goes up by 3%). This makes sense: growth is much higher, profitability is low, so it’s a high-octane bet as a sector. It also shows investors do pay a premium for specific amazing stories (Veeva) which they may be following closely.